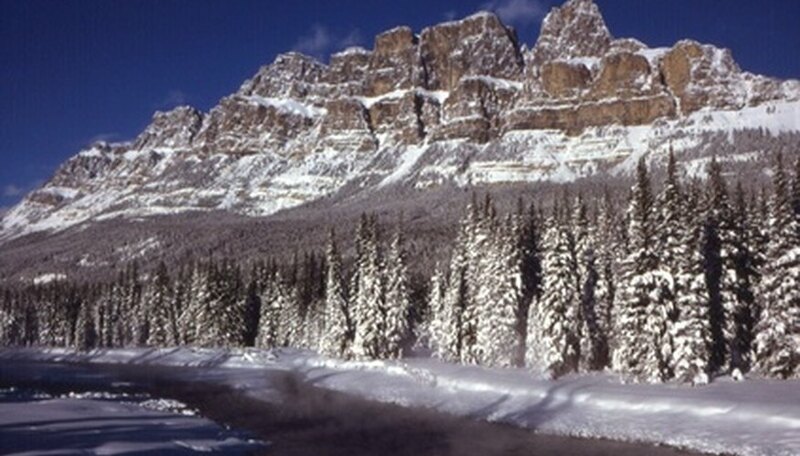 Alberta, a province in western Canada, encompasses climates from tundra to mountains to prairie. Stretching from hardiness growing zones 0 to 3B, the plants of Alberta must face short summers, high winds and long, cold, snowy winters. Transplanting trees that grow in forests in the parklands, sparsely in the tundra and on southern hillsides requires special before and after care to give them the best chance to get established quickly. The best time to transplant trees in Alberta is the spring. Harsh winters don't allow a root ball to get established. The city of Edmonton will plant in the fall, but they have specialized equipment and transplant healthy, undamaged trees less than 15 cm or 6 inches in diameter. The traditional time to plant in Alberta is Queen Victoria's Day, or the May 24 weekend. If there is a freeze after you transplant your tree in the spring, cover it with sheets to protect any tender buds and foliage. Choose smaller trees under 8 cm, or 3 inches, in diameter when transplanting, says North Dakota State University. Digging up a tree causes stress and larger trees take longer to recover. When choosing nursery trees, select those that tolerate your climate zone. When transplanting trees yourself, dig well under the root ball as well as around it to retain as many roots as possible. Transplant immediately for best results. Otherwise wrap the root ball in burlap and keep it moist. Alberta trees need a hole at least twice as wide and the same depth as the root ball. Fill the hole half way with water if the soil is dry and allow the water to soak in. Hold the trunk to position it at the same depth it was growing previously and fill the hole with loamy soil. Damp it down with your feet to eliminate air pockets and water thoroughly. Keep the roots moist throughout the growing season if planting in spring, or soak thoroughly before the first frost in the fall. Transplanted trees don't require fertilizer the first year. Alberta can have freezing periods up to June when moisture becomes ice and unavailable to the tree roots. Soil cracks as temperatures alternate quickly between freezing and melting. Cracks expose a tree's roots to air, which dries them out and causes transplant shock. A 3-inch layer of organic mulch around a newly transplanted tree with a 1-inch air space around the trunk protects against frost heaves, adds nutrients and retains moisture. When Chinook winds roar east from the Alberta Rockies, they can blow trees over. Transplanted trees require either a protected spot from Alberta's strong winds or staking to keep them upright. Stake on opposite sides of the tree. Sink stakes deeply to withstand the force of the wind. Secure with commercial garden tape or old pantyhose, which is soft and stretchy, so it won't cut the bark and expose the tree to wind or pest damage. Remove the support as soon as the roots hold the tree firmly upright. Which Oak Trees Retain Leaves Till Spring?